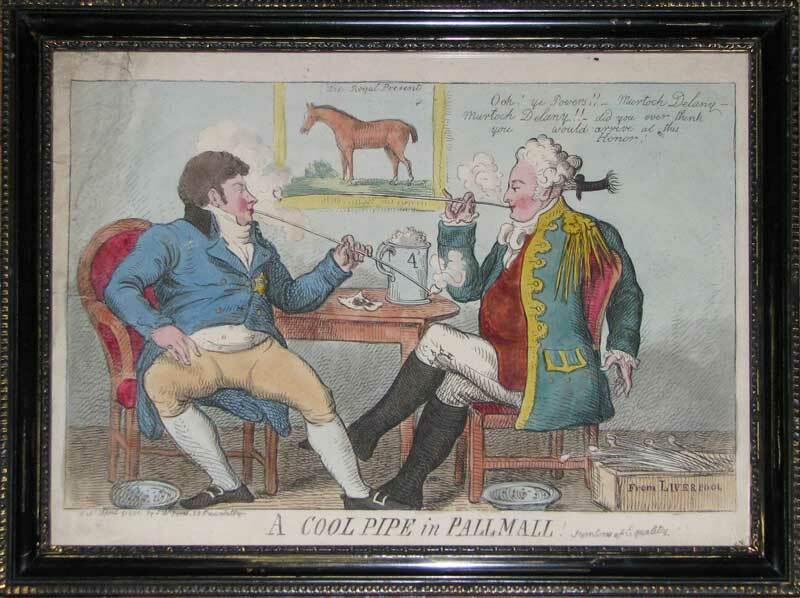 George, Prince of Wales, sits with another man, both smoking long-stemmed pipes, spittoons and a box of pipes labelled 'From Liverpool' at their feet. On the wall is a picture of a race horse titled 'The Royal Present'. The prince says reflectively: ''Och ye Powers!! - Murtoch Delany - Murtoch Delany!! - did you ever think you would arrive at this Honor!''. Murtoch Delany was an Irish servant in Macready's 'The Irishman in London' (1793). Although this man is unidentified, this satire suggests that the Prince of Wales was mixing with an Irishman of lesser standing.